THE END OF B-GROUP: FAREWELL TO LANCIA DELTA S4! GO WITH NEW IDEAS TO WIN THE WORLD RALLY CHAMPIONSHIP. At the end of 1986, in the heart and in the eyes of all the world rally fans were still imprinted the terrible images of the fire in which Henri Toivonen and Sergio Cresto, aboard the Lancia Delta S4, lost their lives. The whole world of rallies, starting with the International Federation, felt the need to put end to that absurd Russian roulette that was road racing with the B-Group of the last generation. 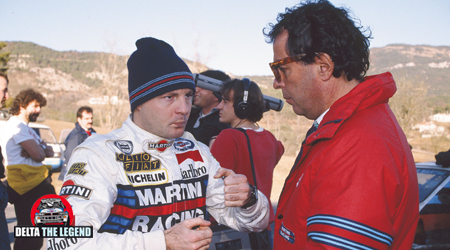 Cesare Fiorio, number one of the sports activities of Lancia Delta, expressed his fears to Jean-Marie Balestre the supreme head of world motor racing. From here began a profound revision of the technical regulation that led to the abolition of B-Group and the adoption of an act which decreed that the world year after would be reserved for cars built in at least five thousand units. To compete in the 1987 world rally championship, a new car was needed … THE BIRTH OF THE MYTHICAL DELTA HF 4WD. Abarth engineers had immediately received input to turn the four-wheel-drive version of the Delta that had taken pride of place at the Turin Motor Show into a competitive machine. The four-cylinder, two-litre turbocharged car was equipped with a much more sophisticated gearbox than the ones used in production cars, with a Torsen differential that could split torque between the front and the real wheels depending on grip. In Turin, the race against time had begun, but it was not going to be an easy job to transform an elegant saloon into a racing car in just eight months. 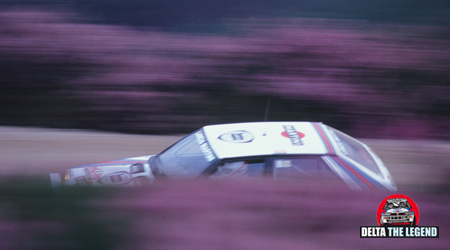 and aerodynamic devices to capture the attention, it was the instantly recognizable colour stripes of sponsor Martini that were the main highlights of the car. January 17/22, Montecarlo. The first round of the World Rally opened the new year with so much snow on the track and the Lancia Delta HF 4WD ready to fight all rivals, Audi, Mazda, Renault, Ford and Volkswagen. Cesare Fiorio decided a precise strategy: between Miki Biasion and Juha Kankkunen, the one chosen to try to win the first race of the season would have been the fastest on the Turini.The intent was to avoid a fratricidal “war” between the two. Miki Biasion had the better of the companion and then also won the race! This inevitably generated some controversy arrival. 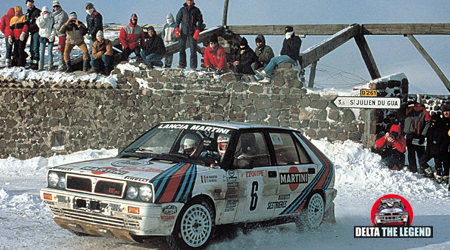 But the most important thing was the signal of strength that the Lancia Delta HF 4WD gave to the World Championship. 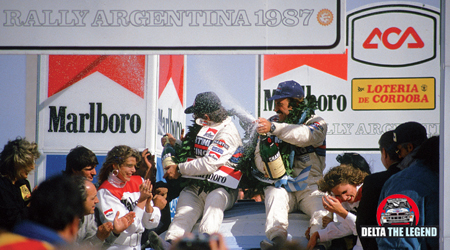 From Montecarlo in then, the car to beat was the “sedan-for-ladies” turned into a winning weapon in record time by Claudio Lombardi, Sergio Limone and their extraordinary team of technicians and mechanics. Few were the failures in season, many triumphs. Lancia Delta HF 4WD, although beaten by Mazda of Salonen in Sweden, by Hannu Mikkola’s very cumbersome Audi at Safari and by Bernard Beguin’s BMW in Corsica, achieved an impressive number of successes. and the Delta rewarded them with success. 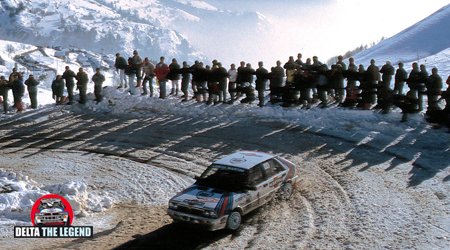 There is no bigger gift for those who love the rally than relive this immense emotion through the opera Delta The Legend, which tells the sporting deeds of the Lancia Delta from 1985 to 1992! Find out more and buy the work (GO TO STORE).